Biographies of Frederick the Great generally emphasise the military and diplomatic events of his reign and neglect to discuss fully the significance of his economic policy. 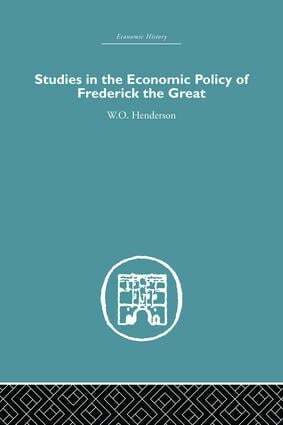 In this series of essays Dr. Henderson deals with various aspects of the Prussian economy in Frederick the Great’s reign. He describes Frederick’s commercial policy, the reconstruction of Prussia after the Seven Years War and the state of the Prussian economy in 1780’s, showing that "alone among his contemporaries Frederick left his country with a far more flourishing economy than it had been when he ascended the throne". The role of the private entrepreneur in Prussia at this time is illustrated by surveys of the careers of the merchants Splitgerber and Gotzkowsky who promoted the expansion of Prussia’s armament, silk and porcelain industries. This book was first published in 1963.